The Supreme Court’s primary judicial duties under Article VI, §5 of the Arizona Constitution, are to review appeals and to provide rules of procedure for all the courts in Arizona. It is the highest court in the state of Arizona and is often called the court of last resort. Seven justices serve on the Supreme Court for a regular term of six years. One justice is selected by fellow justices to serve as Chief Justice for a five year term. In addition to handling case work like the other justices, the Chief Justice oversees the administrative operations of all the courts in Arizona. serves as the final decision making body when disciplinary recommendations are filed against Arizona judges by the Commission on Judicial Conduct . Impeachment is a political process designed to deal with public officials accused of committing high crimes, misdemeanors, or misconduct in office. The person is charged, tried and, if convicted, removed from office. The Chief Justice of the Supreme Court presides over Senate impeachment trials, but renders no decision as to the guilt or innocence of the public official on trial. Formal charges for an impeachable offense are initiated by a majority vote of the Arizona House of Representatives. Conviction for the impeachable offense requires a two-thirds vote in the Senate. Upon conviction, a public officer is removed from office. The role of the Supreme Court in the impeachment process is set forth in Article VIII, Part 2, § 1 of the Arizona Constitution. 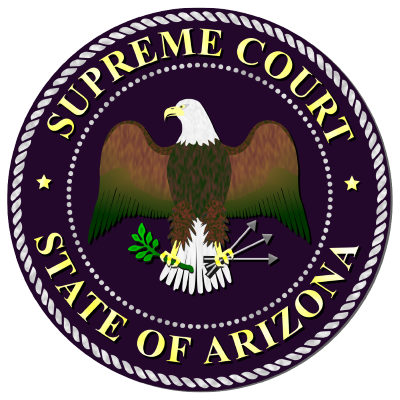 The Arizona Constitution authorizes the Supreme Court to appoint a clerk of the court and assistants. According to A.R.S. § 12-202, the clerk shall attend sessions of the court, issue legal paperwork, enter all court orders, judgments and decrees, keep other books of record and perform other duties as required by law or the court. The clerk’s office maintains the court’s official files and assists in scheduling matters for decisions and oral arguments. The clerk’s office is also responsible for publishing and distributing the court’s written opinions. Must retire at age 70.